First, open up the Classifieds App. If you do not have the app on your Android device, you can download it from the Google Play store. 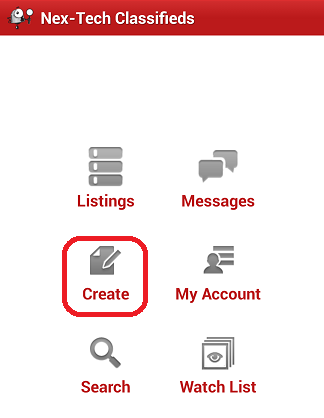 Once the app is open, click on Create to create a listing. 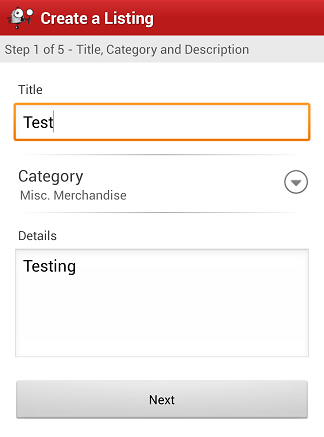 Step 1 - Simply give the listing a Title, select which Category it should go under and enter the Details of the item being listed. Then press Next. 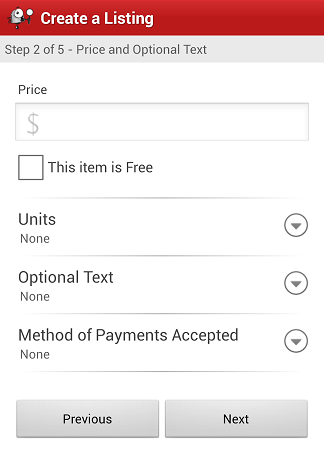 Step 2 is where we enter the pricing information. Once you have entered the information in the relevant fields, press Next at the bottom. Step 3 is the location. 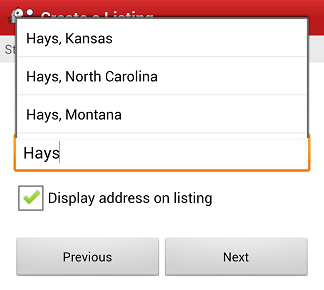 Here you can add a phone number, address and city, state. 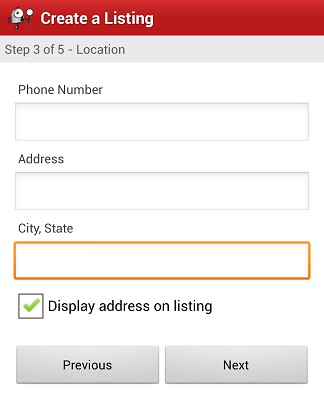 If you enter a phone number, the number will be posted on the listing and users can call/text you. If you wish to not have your number posted, simply leave the field blank. Also, when entering the City, State, a popup should appear that lists cities and states that match what you currently have entered. Select your location from that list. Once all the information is entered on this screen, press Next at the bottom. From here, you can add photos. If you do not wish to have any photos on the listing, just press Next. 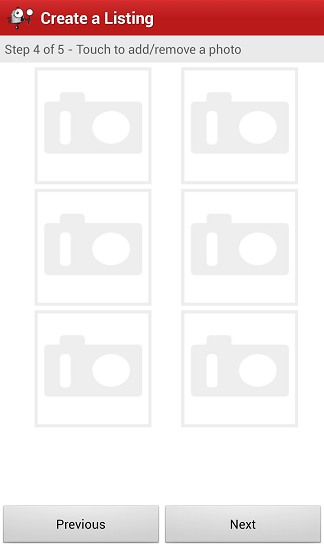 Otherwise, select one of the empty spaces to add a photo. 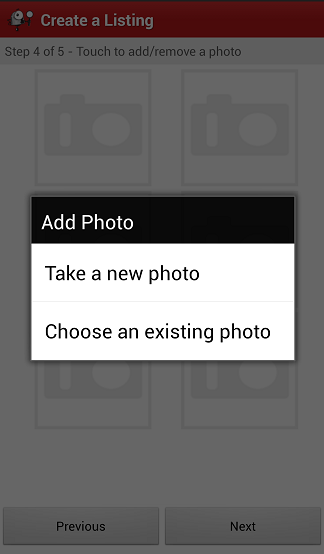 When adding a photo, you have the option to either take a photo, or use a photo that is already stored on your device. 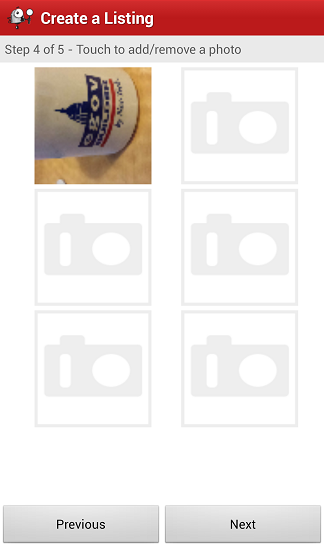 The selected photos will all show up on this page. If you made a mistake and would like to remove a photo, just tap on the photo and you will be given an option to remove it. Otherwise, press Next once your photos have been added. This is the final step! Here you will be given an overview of your listing. Review everything to make sure that it is accurate. If so, press Post Listing and your listing and photos will be uploaded to the Classifieds. Posted - Thu, Jun 13, 2013 at 11:53 AM. This article has been viewed 3501 times.